To Dos seem to be in one of the darker corners of Apple’s productivity apps. Mail, iCal, Address Book and friends are probably what most users (including me) ever want and need. There are some plug-ins for Mail here and here (some of which I use, too), but for the other apps, no big complaints have come to my knowledge. I’m a lazy guy, and I want the machines to do all the boring stuff for me. So I was very excited when the first version of Mail came out where you could just highlight some text and hit the “To Do” button, fix a deadline and you’re done. Shows up in iCal, syncs. Voilà. But then I’m also one of those weird folks who use multiple calendars to keep things organised and colour coded and stuff. One of the first things that struck me was the choice of calendars I got in the To Do Options from the yellow note-paper strip at the top of an email message after hitting the To Do toolbar button. It would only show local calendars, but none of my Mobile Me CalDAV ones. And then, in Mail it would show MobileMe twice under the To Dos? Here are my observations and hypotheses based on them. There are two types of calendars. If you never did anything and just create your first To Do from Mail, you get an “Apple Mail To Do” calendar auto-created for you. You also get a second MobileMe entry under the To Do category in Mail. You’ll notice that in one MobileMe category there are all the To Dos you created in iCal and stored in one of your regular calendars. In the second MobileMe category, you’ll get all the To Dos you created in Mail. Duh. Here goes the eye opener: right-click on the MobileMe category with the Mail To Dos and select “New Calendar…”. Give it a name. The next time you create a new To Do in Mail, you’ll be offered this new calendar for storing your To Do item. If you now go back to iCal, there will also be two MobileMe categories. Don’t despair, enlightenment is imminent. Say you have craeted a To Do in Mail in the new calendar you just created via right click. Now got to iCal, edit the To Do, and open the calendar pop-up. Now choose a calendar fro the top MobileMe category. Switch to Mail and notice how the To Do has moved to the other MobileM category there. 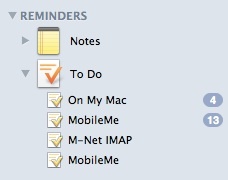 Go back to iCal, and switch the To Do back to a calendar of the lower MobileMe category. Back in Mail the To Do will also have moved back to the first MobileMe category. There are To Do calendars, and event calendars. Based on the above findings, my theory is this: There is a general type of calendars which can hold events and To Dos. This is the default type you access through iCal. But there is also a second type pf calendars, which are exclusively for To Dos. These are exclusively created through Mail (see right-click trick above), and are the only ones accessible through mail. So I created a second set of calendars in Mail, with the same names and colours as the regular ones I already had in iCal. No problems, the system knows how to tell them apart. Whenever I create a To Do in Mail, I see my usual set of calendars with my well-known colours. However whenever I create a To Do in iCal, I must make sure to pick a calendar from the lower (To Do type) set of MobileMe calendars for it. So I keep my events in the general (iCal) calendars, and my To Dos in the To Do type (Mail) calendars. To reduce my own confusion using the same names and coulours in both sets. To make thins more confusing, the Mobile Me Web interface does it differently. I also discovered that the Web calendar has a third interpretation of things. It does not show the To Do calendars created in Mail at all. Consequently it does also not show any of the To Dos in these calendars. does To Dos on special, non-standard calendars only. iCal does To Dos on both, regular event and special calendars. does To Dos on regular calendards only. So I suggest you ask yourself whether the interoperability Mail<>iCal or the interop iCal<>Web cal is more important for you and choose your scheme accordingly. If you need interop across all three, you’re out of luck.